This year we’ve uncovered our strongest success correlation ever at 0.67! Just to give that figure context: normally, 0.2 is worth talking about and 0.3 is noteworthy. Not only is this correlation with success very strong, the insight itself is highly actionable and can become a pillar of your digital marketing strategy. What’s the true value of a share? Today I want to talk to you about the most important online consumer trend in 2018. The story starts in a client meeting about four years ago, and we were meeting with a travel client. We got into a discussion about bounce rate and its implication on conversion rate. The client was asking us, “could we optimize our search and social campaigns to reduce bounce rate?”, which is a perfectly valid question. We’ve just released the 2019 E-Commerce KPI Report, and we have a standout finding, probably the strongest correlation we’ve ever seen between a website engagement metric and a website conversion metric. This is beautiful because we’re all always optimizing for conversion metrics. But if you can isolate the engagement metrics which deliver, which are the money-making metrics, then you can be much more intelligent about how you create digital marketing campaigns. 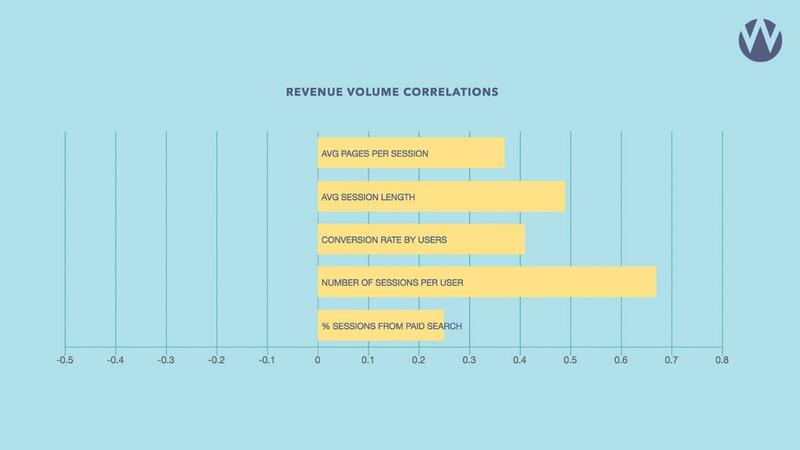 The strongest correlation we’ve ever seen in this study is number of sessions per user, and the metric simply tells us on average how many times did your users visit your website. What we’re learning here is any digital marketing you can do which makes that number increase is going to dramatically increase your conversions, your revenue success. It’s a beautiful metric to plan campaigns with because it changes the focus. We’re not looking for a campaign that’s a one-click wonder campaign. We’re not looking for a campaign that it’s one message delivered multiple times to the same user. Much more so, we’re trying to create a journey, multiple touchpoints which deliver a user from their initial interaction through the purchase funnel, right through to conversion. Let me give you an example. We started this with a story about a travel company. I’m just back from a swimming holiday in the west of Ireland. So let’s say I have a fictional travel company. We’ll call them Wolfgang Wild Swimming. I’m going to be a person who’s researching a swimming holiday. So I’m going to go to Google first, and I’m going to search for swimming holidays in Ireland. I’m going to go to the Wolfgang Wild Swimming web page, where I’m going to read a little bit about their offering. In doing that, I’m going to enter their Facebook audience. The next time I go to Facebook, they’re now remarketing to me, and they’ll be encouraging me to download their e-book, which is a guide to the best swimming spots in the wild west of Ireland. I’m going to volunteer my email to them to get access to the book. Then I’m going to spend a bit more time consuming their content and reading their book. A week later, I get an email from them, and they’re having an event in my area. They’re going for a swim in Dublin, one of my local spots in The Forty Foot, for example. I’m saying, “Well, I was going to go for a swim this weekend anyway. I might as well go with this group.” I go to the swim where I can meet the tour guides. I can meet people who have been on it before. I’m now really close to making a purchase. I hope what you’re seeing there is with each interaction, the Google search, the Facebook ad which led to an e-book download, the offline event, back online to the YouTube video, with each interaction I’m getting closer to the purchase. You can imagine the conversion rate and the return on ad spend on each interaction increasing as we go. This is a really powerful message for us as digital marketers. When we’re planning a campaign, we think about ourselves as though we’re in the travel business too, and we’re actually creating an itinerary. We’re simply trying to create an itinerary of touchpoints that guide a searcher through awareness, interest, right through to action and making that purchase. I think it’s not just our study that tells us this is the truth. A lot of the best-performing campaigns we’ve been running we’ve seen this anecdotally, that every extra touchpoint increases the conversion rate. Really powerful insight, really useful for digital marketers when planning campaigns. This is just one of the many insights from our E-Commerce KPI Report. If you found that interesting, I’d urge you to go read the full report today.